According to sage Kalidasa, Ketu owns Scorpio, exlated in Scorpio, debilitated in Taurus, and its mooltrikona sign is Virgo. Its friendly signs are Libra, and Capricorn, inimical signs are Cancer and Leo and its neutral signs are Aries, Sagittarius and Pisces. Ketu is considered basically a malefic planet, but when posited in 3rd house, exalted or in own signs indicates benefic results. Check lord or constellation in which Ketu is posited under whose sway, it will act. Rahu and Ketu indicate, love affairs, evil thoughts, dissatisfaction, fear complex, sensual nature, illegal cohabitation harsh speech, pilgrimage, may cause denial of progney and may adopt, amputation of body parts, injury, delays, obstacles and disfavour of superiors and Govt; Change of residence, wicked and harsh temperament. Worries due to children. Financial gain and success, fame and stammering when Ketu aspects 2nd house. Ketu is what remains of the body of Rahu. It has no mass shape or substance and is not verified by visual observation. It is a headless half-planet, shadowy and malefic, though not as malefic as Rahu. It is therefore considered a moksha-karak (cause of liberation from the cycle of birth and death). It bestows spiritual tendencies, ascetism and nonattachment to worldly desires and ambitions. It bestows wisdom, powers of discrimination, and gyana - spiritual knowledge, the knowledge of the self. It gives psychic abilities to its natives and makes them masters of the healing arts, natural healing, healing herbs, spices, foods, tantric healing, healing of persons possessed by evil spirits, ghosts and astral forces. Ketu natives also have the ability to go unnoticed or merge into the crowd of common folk. It's effects are similar to those of Mars, but this is only one way of describing the malefic effect and power of Ketu. It can be more destructive if it is inauspiciously positioned in the horoscopes. It destroys the potency of the planet with which it is conjunct making the planet behave in an uncontrollable manner. It is tamasik, of hybrid generation, malefic, awful, and devious in nature. Ketu indicates maternal grandfather. This node is also indicator of imprisonment. Ketu is indicator for all awry activities like magical power, fire or accidents, changing events, and broken relations. Fire, accidents or injury, renunciation, bad nature to have pleasure with other ladies, sour experience, salvation, punishment, imprisonment, fear complex and allergy are attributed to Ketu. It is very strong planet like Rahu when exalted. Worse influence of Ketu can make one's character impious. Disappointment in life and untruthfulness are some characteristics due to influence of Rahu. This node can cause imprisonment. If one express feeling for enjoying life at other's spending like living in a rented home, using car offered by office or etc. are because of the attribution of Ketu like node Rahu. However, Ketu is influential in growing spiritual strength and makes one curious to have desire for more wise knowledge. 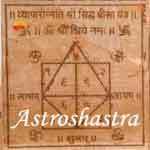 "Om straam streem stroom sah ketve namaha "
Silver Digdosh Nashak Vastu Yantra 4" X 4"